(The Conversation) – NASA’s spacecraft OSIRIS-REx has finally reached the asteroid 101955 Bennu – which may be on collision course with the Earth – after travelling for just over two years since its launch in September 2016. This mission, which will bring grains back for us to study on Earth, is latest to return asteroid samples to Earth after the Japanese Space Agency’s missions Hayabusa 1 and 2 and StarDust. The data will help unveil more about the origins of the solar system and how to protect the Earth from possible asteroid impact. Bennu seen on November 16. NASA/Goddard/University of Arizona. The spacecraft will spend the next year completing a detailed survey of the surface of Bennu (492 metres in diameter) – including locating the most suitable landing sites. Once a site is selected, the spacecraft will land for about five seconds to collect a sample of the surface material using a burst of nitrogen gas to liberate material from the surface into the sampler head. The spacecraft has enough gas to attempt three sample collections from the surface. This will hopefully provide a sample of between 60g and 2,000g of surface regolith material (the layer of material covering solid rock). It will start heading back to Earth in 2021 – getting here in 2023. This artist’s concept shows the OSIRIS-REx spacecraft approaching the asteroid Bennu. Asteroids are material left over from the early solar system, which means they offer a unique look into its early composition. Bennu orbits the sun between the Earth and Mars. Its composition is of particular interest as we already know it is rich in carbon. This means it may contain organic materials that have remained unaltered since the formation of the solar system. It is not impossible that asteroids like it delivered the building blocks of life to the early Earth – the mission could help us investigate this theory. 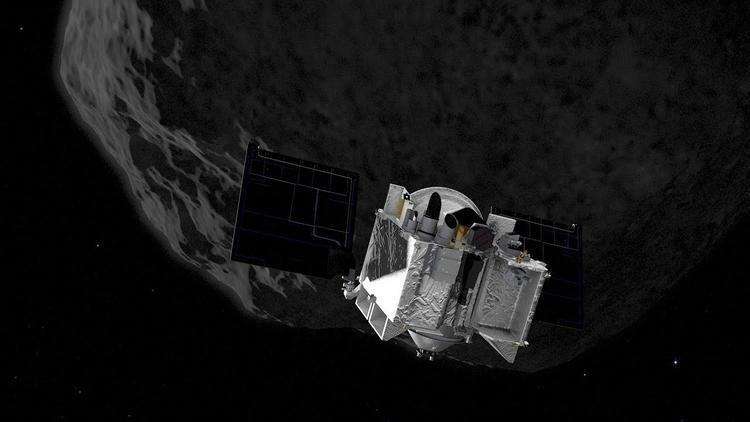 Though sample return is a major and complex part of this mission, OSIRIS-REx will study other aspects of the asteroid too. During the survey of the surface the spacecraft will also be looking out for plumes and natural satellites orbiting the body. Instruments on board will allow enable us to identify different chemicals on it. This will help finding the most interesting and richest sample sites to a resolution of about two metres. The asteroid Bennu is of interest to Earth for another reason. Bennu may be on collision course with Earth in the future. It is theorised from the study of the orbit of Bennu that gravity interaction between the two bodies during a close approach to Earth in 2060 (750,000km) will slightly alter its course. This means that there is a cumulative one in 2,700 chance of an Earth impact between 2175 and 2199. OSIRIS-REx may be able to aid in preventing such events. One of the thing it will measure is the body’s “Yarkovsky acceleration”. This effect is a force that acts on a rotating body in space, caused by the uneven release of heat from the surface of the asteroid. Once this is known, it will be possible to investigate whether we could use this force to change the orbit of Bennu and other threatening asteroids. For example, it may be possible to use solar radiation to heat up one side of the rock more than the other – changing its rotation and the orbit trajectory. The next two years is going to be an exciting one for small body research. This mission will provide the most detailed analysis of carbon rich asteroids and will provide answers about the evolution of the solar system and our own planet. Analysis of the regolith will also tell us more about the effects of space weathering on the surface of small bodies from harsh solar radiation. The collection method for the mission is called “Touch and Go Sample Acquisition Mechanism”. And touch and go is exactly what the spacecraft must achieve, rather than a full landing. This will be extremely difficult and we will have to wait a year to see if the new method is successful. Let’s keep our fingers crossed that it all goes according to plan.